SEE HOW OUR DESIGNS TRANSFORM PROPERTIES. This homeowner wanted a muted palette, with modern cement walls to compliment an updated center hall colonial perched on a rocky hill. A classic Victorian beauty fell into disrepair but new owners gutted the home while preserving and paying homage to this classic architectural style. Backyard slate patio and fieldstone wall, Front yard gardens, refurbished and extended front yard wall. 750 tulips and daffodils put on a colorful show in early spring. Private residence, Larchmont, NY. More frequent coastal flooding demands plants that can tolerate sea water and salty sea air. The entire landscape of this property was devastated by seawater flooding. We brought in new topsoil and re-planted with plants and shrubs at home by the sea. Turf-type tall fescue sod replaces the more traditional (and less salt tolerant) Kentucky bluegrass. We transformed a barren landscape littered with rocks and a simple concrete slab into a modern backyard dreamscape. A sleek pool and patio edged with bluestone pavers creates a serene haven from the rest of the world. The family now has a wonderful oasis to enjoy: an amazing outdoor kitchen with retractable TV, tidy raised beds for growing food and a fire pit for family and friends to gather on a cool evening. After a major exterior house renovation and drainage work, this contemporary traditional home’s garden needed a little love. We designed a mixed evergreen privacy screen to give privacy to the family room window and back patio. 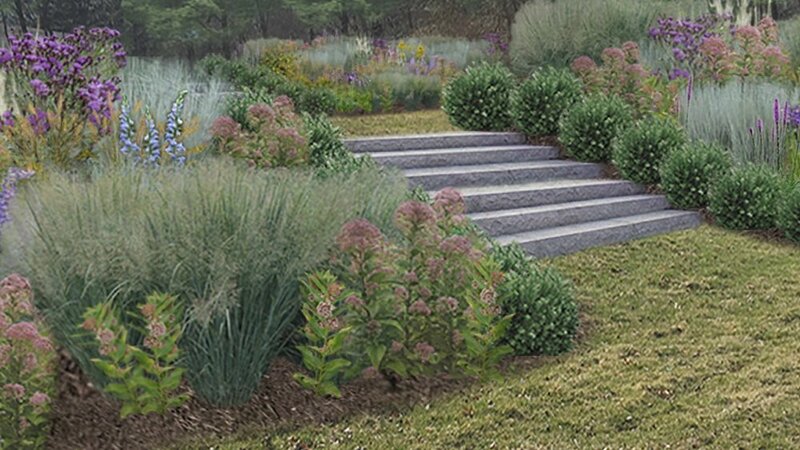 An overstuffed native garden needed editing. So when the homeowners decided to put in a natural pond and waterfall, it was an opportunity to rethink the backyard living space. 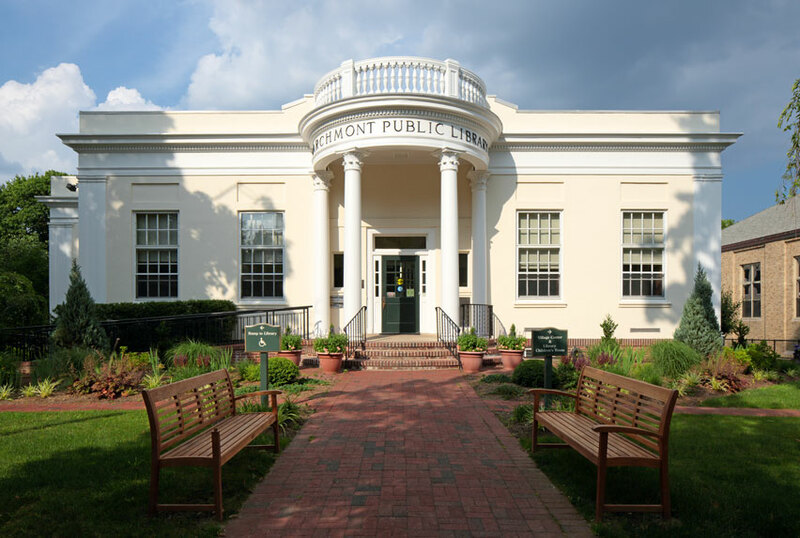 For their centennial project, the Garden Club of Larchmont wanted to refresh the front gardens and walkways for the Larchmont Library. While privet hedges provide privacy, they can also get out of control over the years. We opened up the front again, bringing in light for a perennial flower garden. Brick and stone posts echo the house. Miniature boxwoods fill in between, to create a living garden "wall". We opened the front entry, removing part of the existing wrought iron railing, adding another set of larger brick posts to complement the grand entrance. Large trees in the side yard of this corner property give the dining patio more privacy. Native plants love this sunny hillside of this newly renovated home. 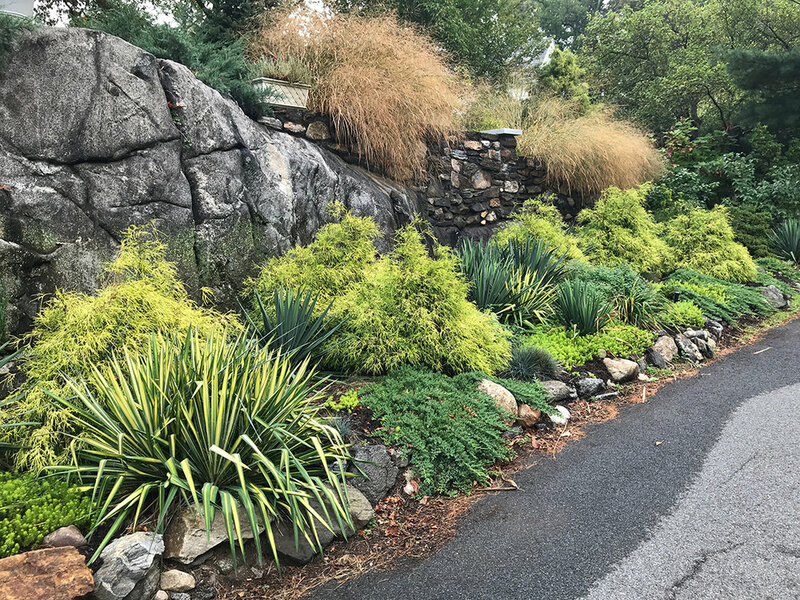 We regraded the front, created a natural stone walkway, seeded a new lawn, and created a natural stone wall at the base of the hill, tucking plants among the rocks. Pictures are from the fall planting and the following spring. Private residence, New Rochelle, NY. 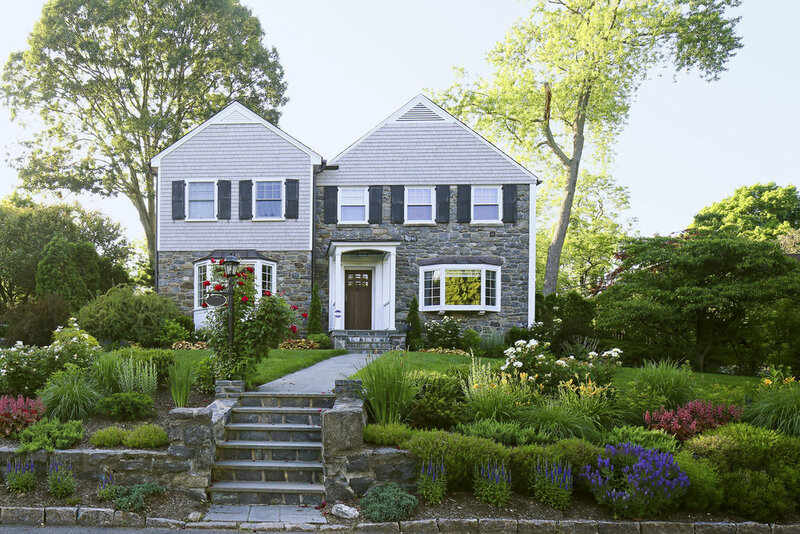 The owners of this renovated stone home wanted to move their ho-hum hedge to make room for more varied plantings, with something blooming in every season. We kept a smattering of evergreens for winter, but added perennials with colorful foliage, to ensure color all year, even when nothing is in bloom. This home is one of the original “beach cottages” that made Larchmont an oceanside retreat for wealthy New Yorkers in the late 19th century. Mature gardens need guidance so they stay in proportion to the homes they were meant to compliment. 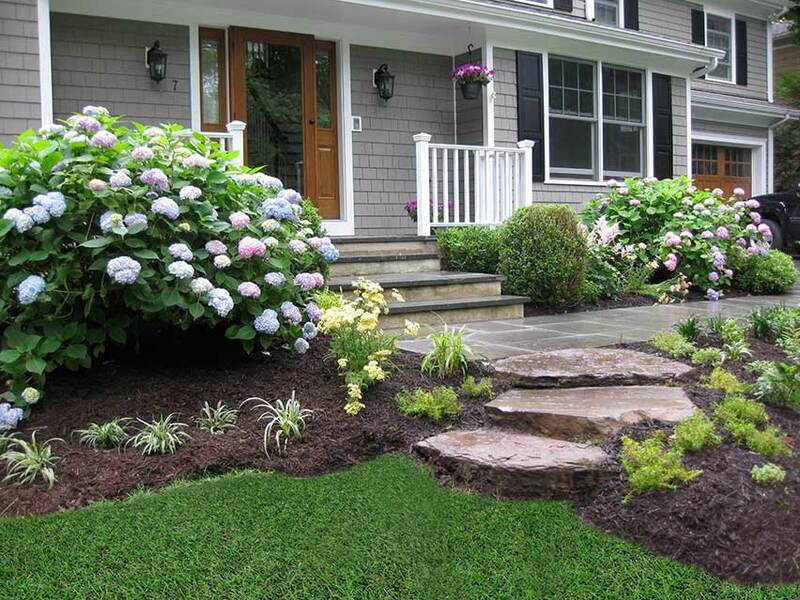 A curbside rock garden has to tolerate snow and salt as well as heat, drought and poor soil. And also look good! Most new home construction comes with what we call, “The Builder’s Special”– 6 azaleas, 8 boxwood, a couple of hydrangeas and they’re done. This transitional modern home was no different.